Pignons was a Swiss company based in Ballaigues that began its life making parts for the watch industry. Pignons bought the rights for a 35mm SLR known as the Bolca Reflex designed by Jacques Bogopolsky, who already had designed the Bolex movie camera (see Bolsey). 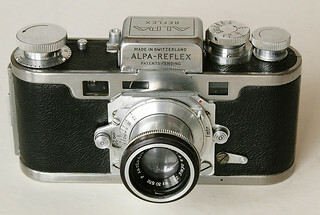 Pignons began manufacturing and launched this camera as the Alpa Reflex in 1944. They made several successive generations of the Alpa models until the beginning of the 1980s. Recently the name Alpa has been revived by a company that appears to have no direct link with Pignons. This page was last edited on 29 October 2018, at 00:58.